If you're looking for African art in San Diego, visit Africa and Beyond™ situated in the enchanting village of La Jolla since 1989. At Africa and Beyond™, you can explore the many faces of African art, from contemporary Shona stone sculptures to traditional artifacts, creating a link between the modern world and the ancient past. The diverse cultural arts of Africa are represented in many unique forms at Africa and Beyond™, where Africa's extraordinary artistic achievements are showcased with an array of one-of-a-kind pieces. You can be assured of the highest quality at exceptional prices. Born and raised in Africa, Ian Allen, along with his partner and wife Julie, travel back to Africa each year to hand-select the exotic treasures for their gallery. The stories they enthusiastically share with each visitor are based on their extensive knowledge and travel experience. Each piece is accompanied by information pertaining to its history and function, providing a deeper appreciation and understanding of each inspirational work. This adds another dimension to the artworks' aesthetic beauty and bring it to life in your imagination. Whether you are a serious collector or a casual admirer, you are sure to discover accent pieces for your home and office as well as memorable gifts. This unique gallery promotes the art of Africa, which reaches out and touches our souls and enriches our world, promoting respect between cultures. African art holds a special place in both heart and home - where the two meet to restore the spirit. 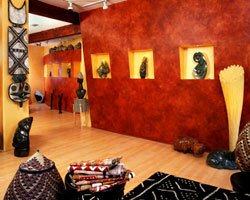 Africa and Beyond™ makes shopping for art an adventure, and is not to be missed! LET THE ADVENTURE BEGIN... ...Go Wild! SEE MORE ON OUR MEDIA & EVENTS PAGE!